Lusse Auto Scooters at Knoebel's Lusse Auto Scooters are the most sought after brand of bumper car by enthusiasts. The old, heavy cars provide quite a "bang" during a collision if they are run at their intended speed. Newer cars, by Lusse and other manufacturers, just do not have the weight and are designed to hit "softer". On some of the greatest rides, you really have to hang on during a hit. Lusse had a manufacturing plant in Southeast Pennsylvania and also produced amusement components for manufacturers of other rides. 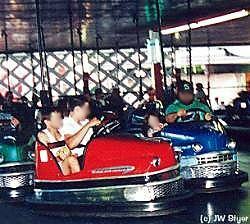 Alas, the Lusse rides are disappearing but a few parks have wisely chosen to keep these vintage rides and take care of them for continued enjoyment. If you know of any other park that has Lusse brand auto scooters, please send email to info@ridezone.com.